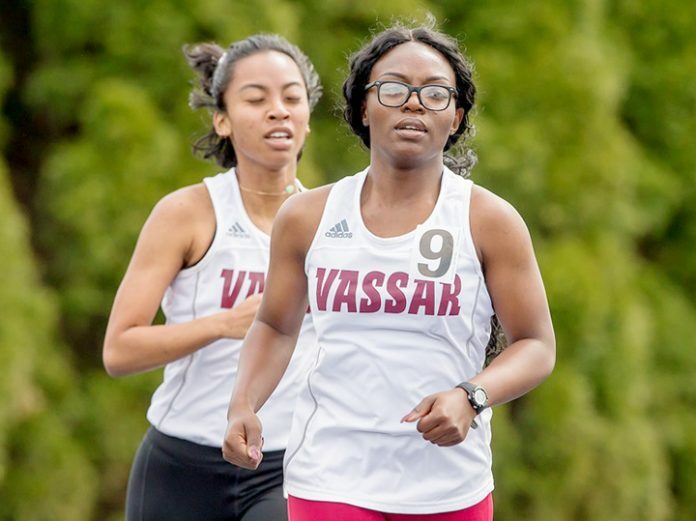 EWING, N.J. – The Vassar track and field team competed at the TCNJ Invitational on Friday and had 13 athletes record personal best times. Keara Ginell won the 3,000 meter with her personal record 10:25.16, which is the second-best time in program history. Ayden Gann led the men’s side with an 800-meter win at 1:54.07. There were many personal bests in the 1,500, starting with Elsa Erling and Hannah Martin on the women’s side. Erling placed second overall at 4:58.20 and Martin was close behind for a 5:01.02 third-place finish. For the men, Jack Casalino took third with a 4:07.72. Reed Dolan hit his best time of 4:12.93. Vassar had a lot of success in the 800. Sarah Newman led the women with a 2:26.36, while Sarah Gillooly was soon after at 2:26.96. Betchaina Dunac also hit her personal record time of 2:37.60. Gibran Mourani broke two minutes at 1:58.15, while Casalino came back with his second personal best of the day, winning his heat with a time of 2:01.37. Joshua Lacoste also ran a personal best 2:05.02. Sophomore Seneca Struab was second behind Ginell in the 3000, running her career-best 10:45.25. Jonathan Dean was the top Vassar men’s finisher in the 3,000-meter race, taking fifth. He ran a personal best 9:10.99. Zak Willis also competed in the same event, running a 9:54.39. The Brewers return to action this weekend Silfen Invitational in New London, CT.